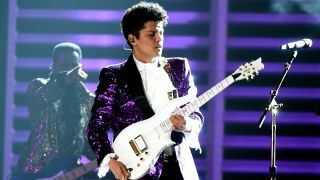 You’ve got to hand it to Bruno Mars: he didn’t hold back when he performed his Prince tribute at last night’s Grammy Awards ceremony. Decked out in full Purple Rain attire and toting an iconic Cloud guitar, Mars gave it his all when he played Let’s Go Crazy, taking on both the main guitar solo and screaming outro. His performance followed one by Prince cohorts The Time, which featured Morris Day and company storming through Jungle Love and The Bird.